Claude Monet. The Studio Boat. 1876. You’ve got to have goals, they say. Smart, well-defined goals. The morning of my eighth birthday was warm and sunny, unusual for mid-April in St. Petersburg (then Leningrad). The first warm day after a long, cold winter. I went out, and sensed the warm touch of sunshine and the cool touch of breeze on my left cheek, both within a single moment. And this unexpected contrast suddenly changed the whole world around me. The time slowed down, the noise of the city faded away, and everything felt just perfectly perfect. I stood there, within this perfect moment, and knew, with absolute certainty, that I HAVE ARRIVED. 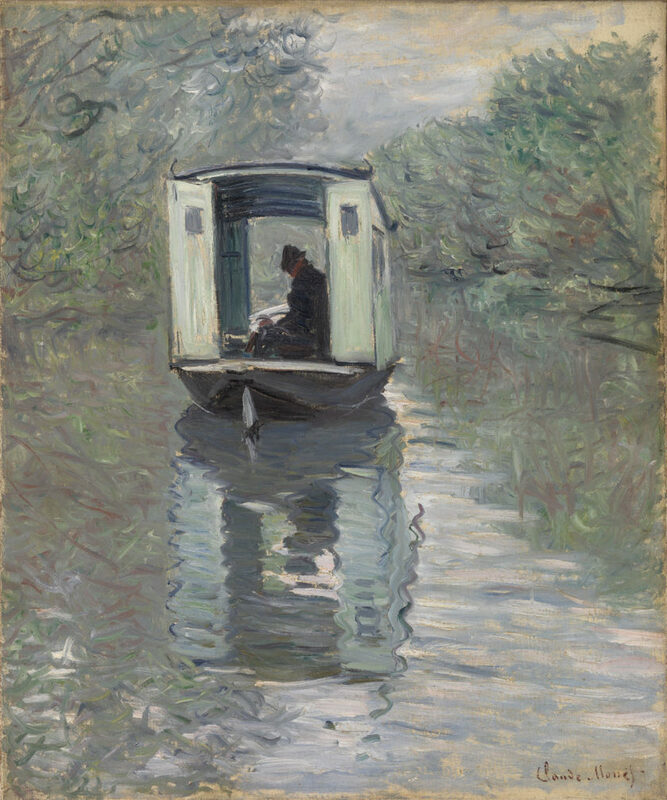 Last week, in our small group for conversations about paintings, we contemplated Monet’s Studio Boat. We meet in this new NOWHERE of virtual space, in the NO-WHEN of randomly scattered time zones. Just to look at paintings — at reproductions hanging in (on?) another nowhere. Or is it the same one? These conversations have the same perfectly goal-less, agenda-less quality as that warm morning of my childhood, in the sacred, mysterious space created and held for us by a painting. The space for peak experiences. And this painting, as though still in-progress after more than a century of hectic, goal-driven activities of humankind that drives itself towards ever-increasing productivity and ever-increasing busyness… — as though Time has stopped within the painting process, and within the moment being painted. It embodies the same goal-less quality in all its dimensions of being — from the boat designed not to go anywhere, to the unfinished areas of the picture plane. I have no quarrels with goals, but if you always know where you are going, doesn’t the journey become a bit boring?